Over the past few years, the most anticipated matchups of the NFL regular season have been when superstars quarterbacks go head-to-head like Aaron Rodgers (Green Bay Packers), Tom Brady (New England Patriots), Drew Brees (New Orleans Saints) and Peyton Manning (Indianapolis Colts). This season one of the best quarterbacks in the league has yet to play a game due to a slow recovery from neck surgery as four-time NFL MVP Peyton Manning has been helpless as a spectator on the sidelines for the Indianapolis Colts. Coming into Week 7, the Indianapolis Colts had failed to win a game in the first six games of the season as they just haven’t been able to get going without Peyton Manning under center. Unfortunately, the Colts seemed headed towards a seventh straight loss against the New Orleans Saints who were looking to use this game against Indianapolis as a bit of a tune-up after losing to the division rival Tampa Bay Buccaneers in Week 6. With the New Orleans Saints hungry for a big win over in Week 7, the Indianapolis Colts were in a trouble and had little chance of pulling off the upset as they were labeled 14-point underdogs. Drew Brees was coming off his worse performance of the season after throwing three interceptions against the Bucs, but he made everyone forget that ugly performance with a career night against the Colts. Not only did the New Orleans Saints beat the Indianapolis Colts in convincing fashion in Week 7, but they were able to light up the scoreboard all night long with Drew Brees having more touchdown passes (5) than incompletions (31 of 35). The Saints offense was just unstoppable and relentless as they put up a season-high 62 points against the lowly Colts who could only counter with seven points of their own. 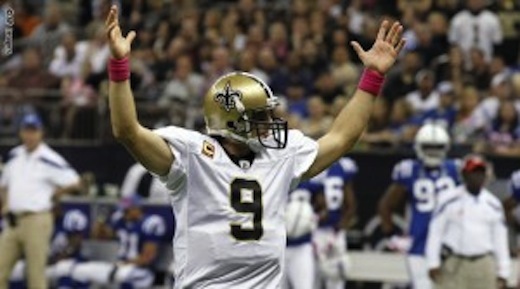 Drew Brees finished the game with 325 yards, five touchdowns, no interceptions and just four incompletions. An amazing performance to say the least as Brees connected with eight different receivers and had a solid running game backing him up with Saints’ running backs racking up 235 rushing yards and two touchdowns. Needless to say, the New Orleans Saints are officially back on track with arguably the best bounce back game in NFL history. Whether or not Drew Brees and company can put on a show like this against an elite team like the Green Bay Packers, San Francisco 49ers, Baltimore Ravens or the New England Patriots remains to be seen, but they definitely seem to be on the right track with Sean Payton and company having their sights set on making a second Super Bowl appearance in three years. It will be interesting to see how things pan out in the NFC South division from here on out as the Atlanta Falcons have gotten back on track with a win over the Detroit Lions and the Tampa Bay Buccaneers have the edge over the New Orleans Saints with last week’s win. The Bucs may challenge and the Falcons could come back, but the Saints seem destined to make the playoffs this season.